Sited on a high rocky headland jutting out into the sea four miles to the west of Omaha beach, Pointe du Hoc would be a tough nut to crack. Despite intensive Allied bombing in the months leading up to D-Day the concrete casements remained stubbornly unscathed and, although reports from the French Resistance suggested the guns might have been moved, nobody knew for sure. It was equally possible the guns were in place and that was a risk that couldn’t be taken if the amphibious assault of Omaha beach was to stand any chance of success. Simon Smith’s piece Vital Assault, one of the most dramatic depictions of the assault on Pointe du Hoc, portrays the men of Dog Company as they unleash a withering volley of return fire, forcing the Germans to retreat. With the prints personally signed by veterans that fought with the US 2nd Ranger Battalion, this dramatic edition is an authentic account of this most historic and famous battle. Platoon Leader of 'Fox' Company, 2nd Ranger Battalion, 80th Infantry Division, on D-Day. Served with 'Dog' Company, 2nd Ranger Battalion, 80th Infantry Division, landing on D-Day+1. Served with the Intelligence and Reconnaissance Squad of 1st Battalion, 116th Infantry Regiment, 29th Infantry Division in the first wave of the assault on Omaha Beach. 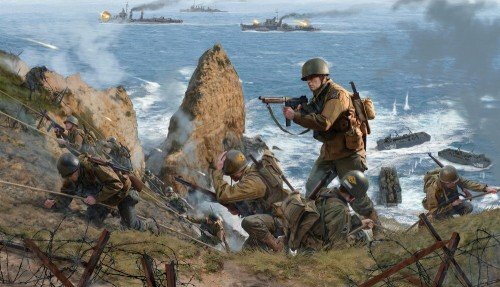 Landing in the first wave on Omaha with the 116th Infantry Regiment, 29th Infantry Division he fought his way through the beach to take out a German gun position in the bluffs.